Jewels for Hope is not your typical handmade jewelry company. Yes, they have beautiful jewelry, but they are also a charitable company. Every time you buy something, Jewels for Hope will donate a a portion of the profits to charity! Some of the charities they support are Hospice, We Stop Hate, and Labs 4 Rescue. I love this! Jewels for Hope is run by a mother/daughter team and has a large selection of jewelry for all occasions. Many of their pieces have been gifted to celebrities! 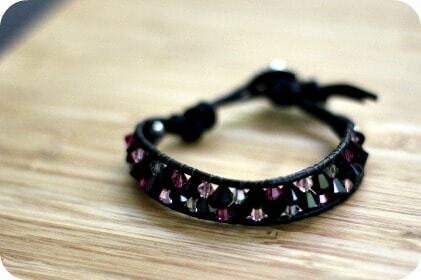 I received this gorgeous MTV Movie Awards Swag Bag Bracelet made with pink, black and grey Swarovski crystals. It’s on a leather cord with a chic silver button. This particular bracelet was gifted to Sarah Jessica Parker and was featured in the MTV Movie Awards Gift Lounge. It’s really something to see in person. I love how the crystals catch the light and glitter. You can buy this bracelet for $130 and you will also be supporting SWAN (Support Women Artists Now) with your purchase. They also sent me this pretty grey beaded necklace. 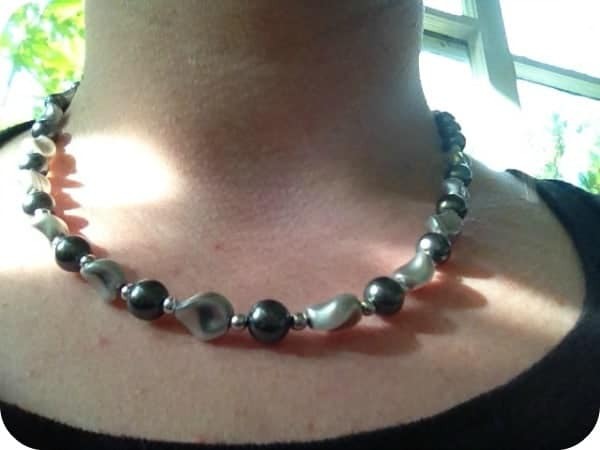 It looks like the beads are grey pearls! I couldn’t find it on their site, but there’s a few similar necklaces like this Purple Swarovski Crystal & Pearl Necklace. It’s simple, yet elegant and will look great with my dress I’m wearing this week for my cousin’s wedding in Las Vegas. Grey pretty much goes with anything and I have lots of dresses that it will look amazing with. Jewels for Hope ships internationally! This is great news since I’m located in Canada. If you are looking for something nice for yourself or to give as a gift, I recommend you check out Jewels for Hope for their unique, high-quality and just plain fabulous jewelry! Jewels for Hope is my sponsor for the Fall Fashionista Giveaway on October 11th. Make sure you come back and enter! Connect with Jewels for Hope on Facebook, Twitter and their blog. Thanks for letting us know about Jewels for Hope! I love that they support charities and that they ship to Canada too! These are really pretty, and it sounds like the money goes towards some great causes! I love companies that give back – thanks!! such a pretty bracelet, and great cause! I have 2 of their necklaces. They are so beautiful. I am always looking to see what they design next. I love their jewelry! Love the jewlry and love the cause two important things. Their jewelry looks great, I love the necklace. I try to support companies that give back to the community. Didn’t know about this company but will have to check it out. What a beautiful bracelet! I love that it was started by a mom and daughter and supports several charities. I spent a lot of time going thru their site and all I could find was the vague statement that a ‘portion of the profits’ is donated. I realize this is not a nonprofit organization but normally it is stated how much donation is generated by a given purchase. This is very pretty jewelry! I really like this program that everytime you buy an item they donate to charity! The necklace displayed is gorgeous! Thanks for letting us know about these products that I was not aware of before. They are such pretty colors and designs for us ladies and girls to wear this season . I mostly like the fact that they are not all out for just the money as they donate some of their profits to charity . I think that is great of them to do. I love this jewelry (and I’m not a jewelry girl) but the idea that some of the proceeds also go to charity is awesome!! I like this jewelry.. when it read homemade I could not believe it!! Now these are different from some of the other jewelry companies. This I see as a piece of jewelry and not just a donation. Great review and information for holiday shopping. I love the idea of a gift helping a charity or organization in addition to being a great gift. Thanks! I love it when a company does this. They have great looking stuff and will be checking them out! What a cool company :). Good for Christmas gift ideas! Beautiful jewelry and for a great cause. There should be more companies like this! !